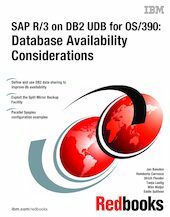 This IBM Redbooks publication describes availability procedures for the database of an SAP R/3 4.6B installation that uses DB2 UDB for OS/390 as the SAP R/3 database server. The book is one of a series that focuses on SAP R/3 when DB2 UDB for OS/390 is used as a database server. This book reflects the considerable development effort, both by SAP AG and by IBM, that has been focused on the area of database availability due to the reliance on SAP R/3 by customers who expect a high degree of availability, in some cases 24 hours per day, every day of the year.